The International Wood Culture Society (IWCS) is soliciting entries for the design of the Distinguished Service Award (DSA) for the INTERNATIONAL UNION OF FOREST RESEARCH ORGANIZATIONS (IUFRO). The competition is a cooperative effort between IWCS and IUFRO in celebration of the 2019 World Wood Day theme of CHANGE, to heighten the need for awareness to make changes for a sustainable future. The current design of the award (see below) has already served for many years thanks to its clear, elegant and timeless shape. Now it would be the ideal time to “change” this design – in accordance with the motto of the “WWD 2019”. What is the purpose of the IUFRO Distinguished Service Award? Created in 1981, the award was designed to recognize those whose work has substantially furthered the aims of IUFRO. Design: Clear, not too playful (it is an award for renowned scientists); appropriate size. Leave enough space for a name plaque! Proposals must be clearly written, with sketches or digital drawings to describe the design. Include five samples of previous work, preferably work that would reflect the style of the award proposal. The actual Awards should be ready by end of June 2019 for presentation at the next IUFRO ceremony. A jury consisting of representatives of the International Union of Forest Research Organizations (IUFRO) and the International Wood Culture Society (IWCS) will select the top three proposals based on the criteria mentioned above. 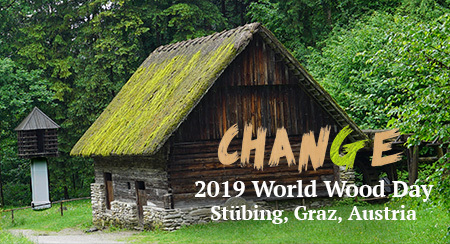 The winner will receive a prize of 500 EUR, and the runners up will receive 250 EUR each from IUFRO at the 2019 World Wood Day Event in Stübing/Graz, Austria. Furthermore, the winner would ideally be awarded a contract to produce up to 50 pieces of the winning design by the end of June 2019. The winner and the two runners up will be communicated widely through IUFRO media (online newsletter, social media). 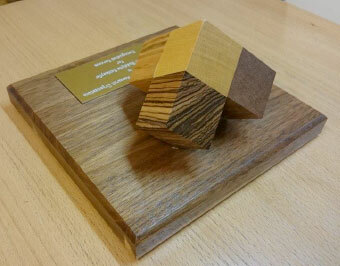 Previous design of the IUFRO Distinguished Service Award, consisting of a wooden base and 5 wooden cubes made of woods from five different continents. A metal name plaque will be attached before the award presentation.